Dutton Books for Young Readers, 9781101994702, 256pp. 17-year-old Arman Dukoff can't remember life without anxiety and chronic illness when he arrives at an expensive self-help retreat in the remote hills of Big Sur. He’s taken a huge risk—and two-thousand dollars from his meth-head stepfather—for a chance to "evolve," as Beau, the retreat leader, says. Stephanie Kuehn is the critically acclaimed author of four young adult novels, including Charm & Strange, which won the ALA’s William C. Morris Award for best debut novel. Booklist has praised her work as “Intelligent, compulsively readable literary fiction with a dark twist.” She lives in Northern California and is a post-doctoral fellow in clinical psychology. 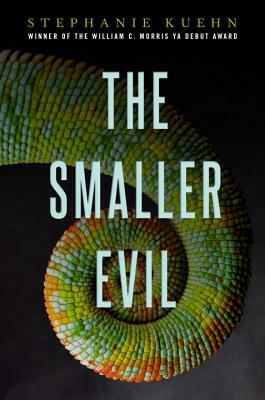 "Suspenseful and enigmatic, bristling with Stephanie Kuehn's vivid prose and sharp-eyed characterizations, The Smaller Evil kept me guessing till the very last page. I immediately flipped back to the first page to read it again, and so will you." —Laura Ruby, Michael L. Printz Award winning author of Bone Gap.